Where were you when John F. Kennedy was shot? Many are remembering because Nov. 22 will mark the 50th anniversary of JFK’s death. Reporters who covered the 1963 assassination in Texas shared their experiences at the Club Nov. 4. “[The Kennedy visit] was the biggest story of the year,” said CBS News senior correspondent Bob Schieffer, who was a cub reporter on the Fort Worth Star Telegram at the time. Presidential travel was rare, he said, indicating the Kennedys were there to raise money for the next election. 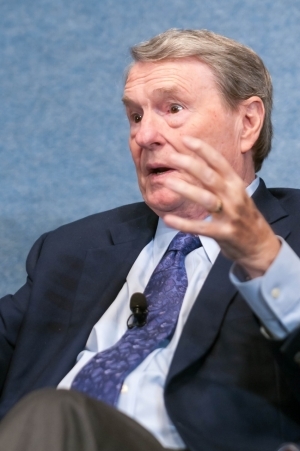 “There was a big reception in Dallas,” noted PBS News Hour anchor Jim Lehrer, who had been assigned to cover the arrival of Air Force One for the Dallas Times Herald. Retired Hearst columnist Marrianne Means, the only female reporter in the motorcade, said there was panic when the shots were fired, as no one knew where they were coming from. Means said she has never been able to forget the horror of seeing the president with half of his brain missing when she arrived at the hospital later. Sid Davis, a 40-year veteran reporter and former  White House correspondent, was a Westinghouse radio correspondent at the time and in the motorcade. He explained that Mrs. Kennedy moved to the trunk of the car during the incident in an attempt to retrieve part of her husband’s skull, which she gave to doctors at the hospital. Davis, who was on board Air Force One when President Lyndon B. Johnson was sworn in as President, spoke of Mrs. Kennedy’s courage and Johnson’s polite and caring demeanor during the ceremony. Johnson invited Mrs. Kennedy and Kennedy staffers to be present, which Davis noted was generous, as there were approximately 28 people in the tiny room of the plane and the temperature was about 100 degrees. He mentioned that Bobby Kennedy, the U.S. attorney general, instructed Johnson to be sworn in on the plane. Schieffer noted that a memorable moment for him was when a woman called him in Fort Worth to ask for a ride to Dallas. “My son has just been arrested,” she said. Schieffer was able to interview Lee Harry Oswald’s mother during the trip. He indicated she seemed more concerned about herself than her son. All agreed that, while covering the tragedy may have helped their careers, it had an even greater effect on them personally. “To see this strong man cut down in seconds,” Schieffer said, noting the jolt of the unexpected tragedy,"...had a huge impact on me as an individual,” Lehrer agreed, remembering that he had been a reporter for about four years before the assassination. “We thought they were invincible,” Schieffer added.